Tainan, officially Tainan City is a special municipality of Taiwan, facing the Taiwan Strait in the west and south. 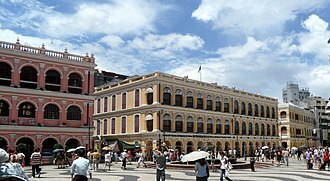 Tainan is the oldest city on the island of Taiwan and known as the Capital City for its over 200 years of history as the capital of Taiwan under Koxinga. 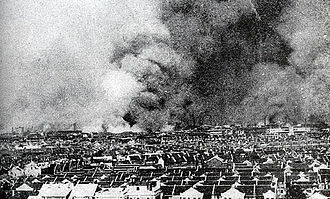 Tainans complex history of comebacks and renewals inspired its nickname the Phoenix City. 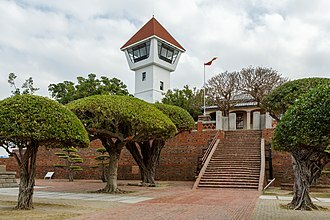 Tainan was initially established by the Dutch East India Company as a ruling and trading base called Fort Zeelandia during the period of Dutch rule on Taiwan. 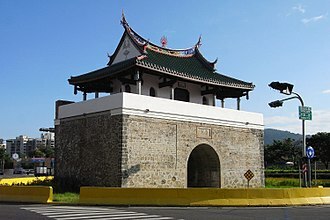 Tainan has been regarded as one of the oldest cities in Taiwan. 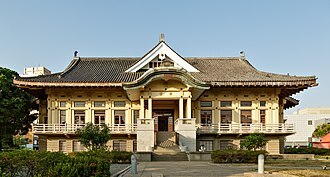 The city houses the first Confucian school–temple, built in 1665, the remains of the Eastern and Southern gates of the old city, Tainan claims more Buddhist and Taoist temples than any other city in Taiwan. 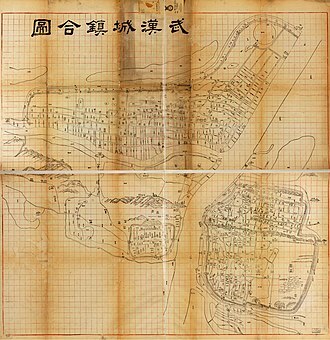 Archaeological excavations in the township of Zuozhen suggest that the Tainan region has been inhabited for at least 20,000 to 31,000 years, the indigenous Siraya tribe dominated the region by the 16th century. The Sakam people of the Sinkan sub-tribe inhabited in the area of the present-day city, other Sirayan sub-tribes, including the Soelangh and Baccloangh inhabited in the surrounding area. 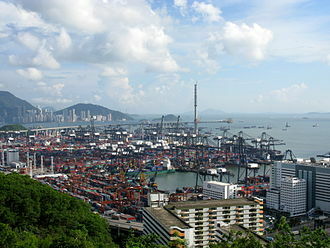 By the late 16th century, Chinese merchants and fishermen had set up bases along the west coast of the island. 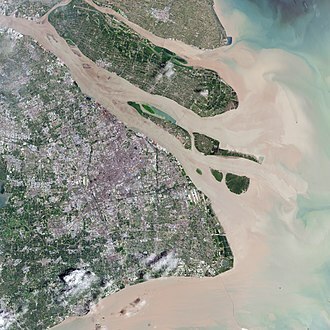 The Chinese adopted Taioan as the name of the sandbar, slightly north of Taioan, along the shoreline near Bassemboy, Japanese traders established bases for trade with China. 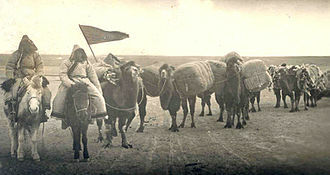 The early Chinese and Japanese traded with the Sirayan people and food was exchanged for deer hides and dried deer meat. 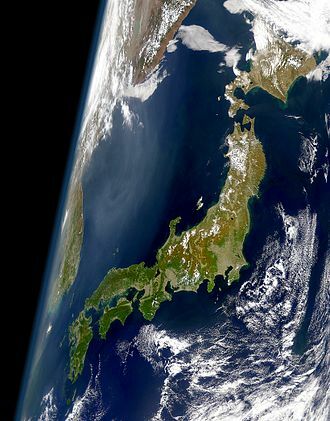 The Siraya people were influenced by both Chinese and Japanese cultures and lifestyles and they started to use Chinese words in their language, use Japanese tantō in ritual events, and migrated inland due to the influx of newcomers. By the time the Europeans arrived, the influence of Chinese and Japanese traders, early Dutch colonists had attempted but failed to control Macau and the Penghu islands. In July 1622, the Dutch East India Company textile merchant Cornelis Reyersz sailed to Taiwan in search of a location to build a trading post. 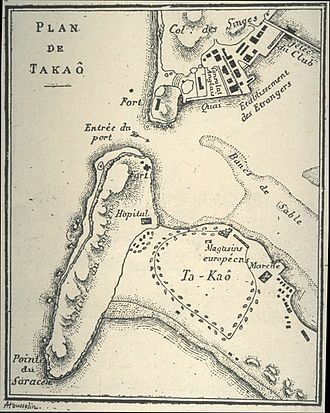 In 1624 he established a fort named Orange on the sandy peninsula they called Tayouan. Taoyuan, is a special municipality in northwestern Republic of China, neighboring New Taipei City, Hsinchu County, and Yilan County. 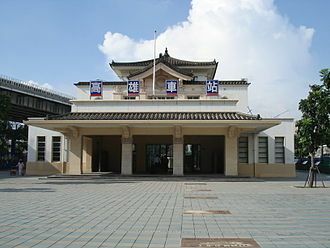 Taoyuan District is the seat of the government and that which, along with Zhongli District. 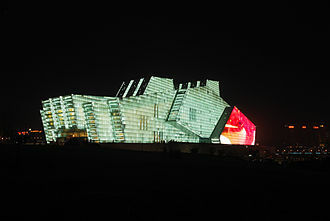 Taoyuan developed from a city of Taipei metropolitan area to be the fourth-largest metropolitan area. Since commuting to the Taipei metropolitan area is easy, Taoyuan has seen the fastest population growth of all cities in Taiwan, Taoyuan means peach garden, since the area used to have many peach trees. The city is home to industrial parks and tech company headquarters. 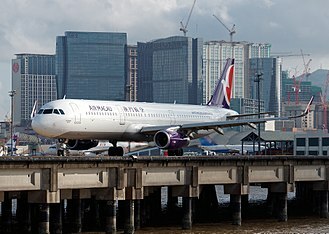 Taipei Taoyuan International Airport, which serves the capital, the city of Taoyuan has been elevated to special municipality status since 2014 from the original Taoyuan County. 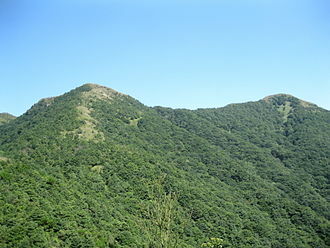 At the same time, the former county-controlled city of Taoyuan was promoted to Taoyuan District within the new municipality, in ancient times, the Taoyuan plateau was the home of the Taiwanese plains aborigines. 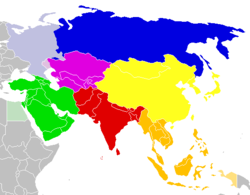 In prehistory, the Ketagalan people settled in Nankan, in the early years of Dutch colonization, Spanish colonization, and Zheng He of the Ming Dynasty, there were no large-scale cultivation or industrial activities. During the Qing era, a number of people from Fujian Province and Guangdong province began to immigrate into present-day Taoyuan to develop and they planted peach trees, when fully bloomed in spring, were so beautiful that the people named the land Toahong. 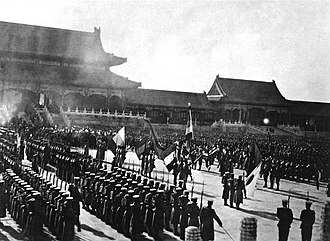 In November 1901, under Japanese rule, an administrative office. 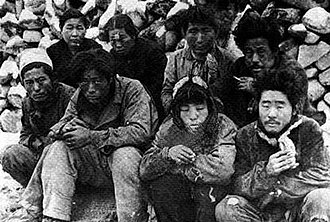 In 1909, the number of cho were reduced and the unit was renamed Tōen Chō. 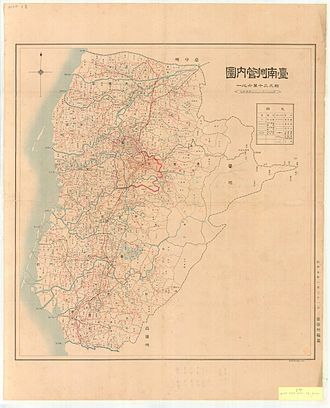 In 1920, the Tōen area was incorporated into Shinchiku Prefecture, during the Japanese era, the staged migration policy caused Taoyuan to develop into a city with a variety of cultures. 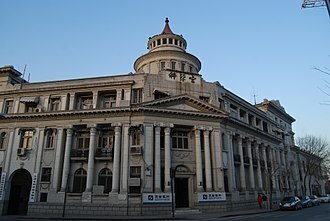 For example and worship paths symbolized cultural systems, butokuden were used to represent military systems, and the old Taoyuan City Office signified political systems. 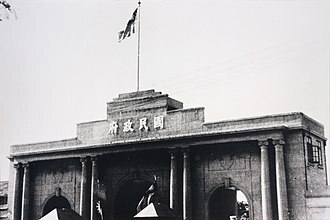 In 1950, Taoyuan County was established by the Republic of China government, on 21 April 1971, Taoyuan City was made the capital of Taoyuan County. 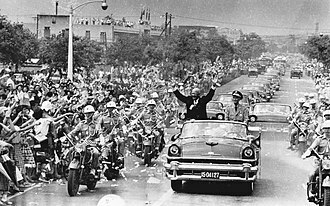 At the edge of the Greater Taipei region, this caused some structural, trade prosperity in recent years and the proliferation of job opportunities helped Taoyuan develop into a major economic district in northern Taiwan and the population has increased ever since. 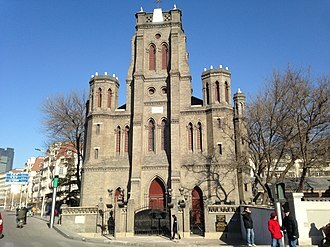 Jinan, formerly romanized as Tsinan, is the capital of Shandong province in Eastern China. 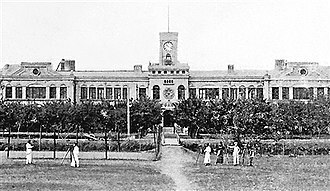 The city has held sub-provincial administrative status since 1994, Jinan is often called the Spring City for its famous 72 artesian springs. Its population was 7,067,900 in 2014 with a population of 4,693,700. 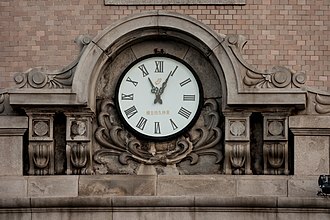 The modern-day name Jinan literally means south of the Ji and refers to the old Ji River that had flowed to the north of the city until the middle of the 19th century. 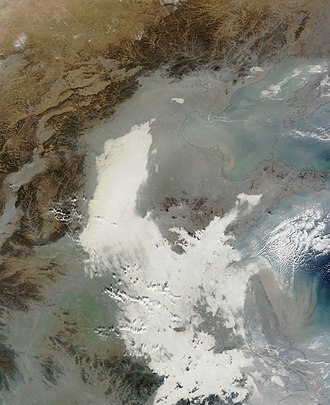 The Ji River disappeared in 1852 when the Yellow River changed its course northwards, the current pronunciation of the character Ji with the third tone was established in the late 1970s. Prior to this, it was pronounced with the fourth tone, older texts spell the name as Tsinan or Chi-nan. During the times of the Zhou dynasty, the city of Lixia was the settlement in the area. 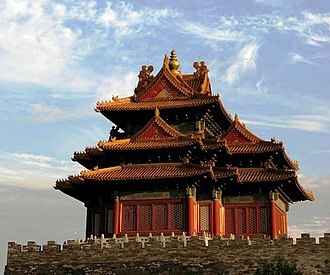 The name Lixia refers to the location of Jinan at the foot of Mount Li, Lixia is the name of one of the citys districts. 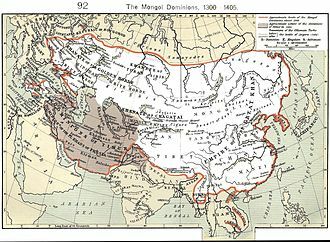 Marco Polo gives a description of Jinan under the name Chingli or Chinangli. 19th and early 20th century texts frequently give the name of the city as Tsinan Fu where the additional Fu comes from the dated Chinese term for a provincial capital. Jinan is referred to by the nickname City of Springs, because of the artesian springs in the urban city centre. The area of present-day Jinan has been inhabited for more than 4000 years, the Neolithic Longshan Culture was first discovered at the Chéngzǐyá site to the east of Jinan in 1928. One of the features of the Longshan Culture are the intricate wheel-made pottery pieces it produced. Most renowned is the black pottery with wall thicknesses that can go below 1 millimeter. 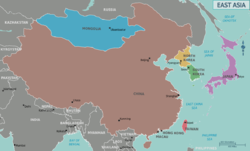 During the Spring and Autumn period and Warring States period, the area of Jinan was split between two states, the state of Lu in the west and the state of Qi in the east. In 685 BCE, the state of Qi started to build the Great Wall of Qi across Changqing county, portions of the wall still remain today and are accessible as open air museums. Biǎn Què, according to the legend the earliest Chinese physician, Zou Yan, a native of Zhangqiu City, developed the concepts of Yin-Yang and the Five Elements. Chongqing, formerly transliterated as Chungking, is a major city in Southwest China and one of the Five national central cities in China. 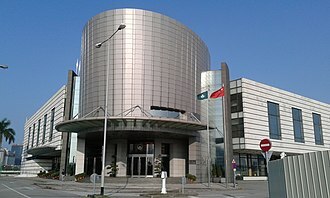 Administratively, it is one of Chinas four direct-controlled municipalities, the municipality was created on 14 March 1997, succeeding the sub-provincial city administration that was part of Sichuan Province. 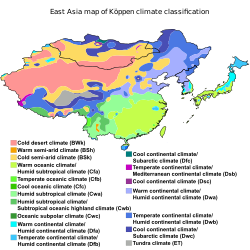 Chongqings population as of 2015 is just over 30 million with a population of 18.38 million. 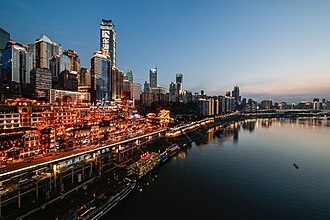 The official abbreviation of the city, Yu, was approved by the State Council on 18 April 1997 and this abbreviation is derived from the old name of a part of the Jialing River that runs through Chongqing and feeds into the Yangtze River. Chongqing was a Sichuan province municipality during the Republic of China administration, Chongqing has a significant history and culture and serves as the economic centre of the upstream Yangtze basin. It is a manufacturing centre and transportation hub, a July 2012 report by the Economist Intelligence Unit described it as one of Chinas 13 emerging megacities. 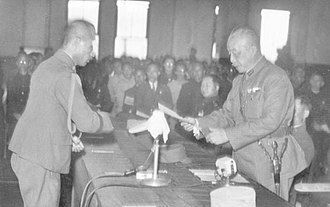 Tradition associates Chongqing with the State of Ba, the Ba people supposedly established Chongqing during the Spring and Autumn period after moving from their first capital Yicheng in Hubei under pressure from Chu. This new capital was first named Jiangzhou, in 316 BC, the state of Ba was conquered by the State of Qin. Jiangzhou subsequently remained under Qin Shi Huangs rule during the Qin Dynasty, the successor of the Qin State, and under the control of Han Dynasty emperors. 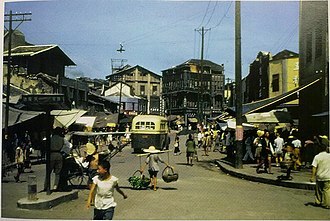 Jiangzhou was subsequently renamed during the Southern and Northern Dynasties to Chu Prefecture, in 581 AD to Yu Prefecture, the name Yu however survives to this day as an abbreviation for Chongqing, and the city centre where the old town stood is called Yuzhong. It received its current name in 1189, after Prince Zhao Dun of the Southern Song Dynasty described his crowning as king, in his honour, Yu Prefecture was therefore renamed Chongqing subprefecture marking the occasion of his enthronement. 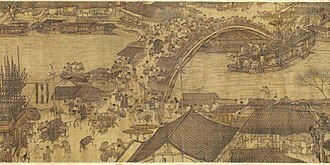 In 1362, Ming Yuzhen, a peasant rebelling leader, established the Daxia Kingdom at Chongqing for a short time, in 1621, another short-lived kingdom of Daliang was established by She Chongming with Chongqing as its capital. 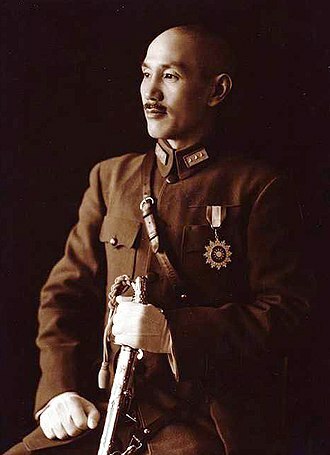 Lu Shiow-yen, the incumbent Mayor of Taichung. 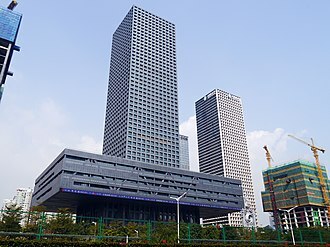 Taichung's financial centre - Xitun District.